March 10th 2014 - What a topic. We recorded this a few months back to be ready for February on request from an Elder who had some questions that needed answering. We had no idea of what was to follow. In late January, when over thirty seniors burned to death in their retirement building in Quebec, the collective consciousness of Quebec, Ontario and wherever in the world this story was shared turned to think about our Elders. There is a communal mourning for the deaths of those who helplessly perished and a deep compassion for the survivors and the families of these elders of ours. Also since the recording of this, both my partner and I lost our Mothers so much of what I learned in this wise teaching has been echoing through my life in a deeply personal way since it was recorded. May these understandings help you, whether it is for your grandparents, your parents or in your own journey through the Elder years. We will keep you posted on how to join us on our Blogtalk Radio show AWAKENING SPIRIT HERE ON EARTH us through our newsletter or on Facebook at our Here On Earth page. You can find us and like us on Youtube and Pinterest too! Thoughts on our attitudes towards Elders. I have seen the despair in the vacant eyes of our elderly men and women, reduced to the bare bones of life. Homes,careers. families and belongings pared down to the essentials, a single bed and a few pictures. Is this what we have to show for our great first world commitment? Yes there are fancy pretend hotels for those that can afford it, where you can ‘Wii’ bowl and go on bus excursions and pretend to be happy in the great dining halls serving Salisbury steak and mashed on Saturdays, but it still feels wrong. I have heard that Germany and Switzerland are ‘outsourcing’ their seniors to Thailand because there, they love their elders so the care given far exceeds Europe. A culture of respect, you can trust your parents and grandparents will be loved and treated kindly, unlike here in North America where elder abuse is rampant. We have to heal this, it is so wrong. Our Elders need to feel respected, loved, honoured and needed, and we have a long way to go to make this a reality. 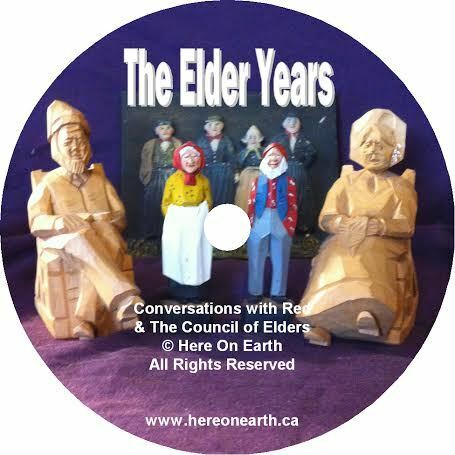 I am grateful for the advice from the Council on The Elder Years recording, it gives us a place to start. I was interested in the ideas of creating collective homes for like minded people. Building community support so our Elders can live independently, but not alone seems very sane to me, but I also am aware of how important it is for all of us to start behaving with much more respect than we do. I was talking to an elder who told me what it felt like to be ignored in stores, on buses and in restaurants, and I was ashamed on behalf of us all. In every Aboriginal community I have stayed with, Elders are fed first and served at any social gathering and are never left alone and unattended. Pay attention to who you see in line first in other social gatherings. It sure is not the Elders. We need to demonstrate proper behavior in every social situation by offering respect and service to our Elders, role modeling healthy attitudes. It begins at home and in the community. The new Moon on January 30 at 11:20 pm PST begins the year of the Horse according to the ancient traditions of China. This New Year begins on the second new Moon after Winter Solstice, with the Sun and Moon in Aquarius. This is in Chinese astrology the month of the Fire Tiger making things pretty intense as the Horse year begins. We had all of last year in Water snake, reflecting, absorbing and getting ready to shed our skins and be ready to navigate new waters. The wooden horse year we have entered may be tricky. I have the image of a kaleidoscope come to mind, how every movement can shift reality very quickly. Those who have been studying with the Council are aware that we live in a multi-dimensional world of parallel universe and I have a feeling this year can jump realities very quickly, like a racing horse jumping rivers and obstacles in a fast paced race to the future. Any tug on the reins can shift direction quickly. This year is not a year to be hesitant, we will need to be accomplished riders and will need to trust the horse and give her her head, while keeping our grip on the reins. A good rider works with his or her horse, trusting instinct and homing sense. Set your intention and seat yourself firmly. I have a feeling it is going to be a wild ride. Yes, it is a new time. A new year… may your horse run true and finish well… with distinct factors and conditions of stepping into a different world of experience. So, like nomads crossing a high ridge into a new territory, pause a moment to sniff the air, to scan the horizon before choosing the way forward. If the air pressure suddenly changes in your experience, do pay attention. The tides are shifting. her into his arms, to the dance that she’d choose. she dances the dew’s hallowed ground. who forget that the soul knows the faith to believe in. she dances in her old wedding gown. called here by the beauty of a love never missing. she dances loves' deepest romance.